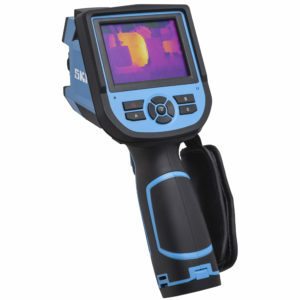 Maintenance technicians and experienced thermographers can detect hotspots quickly and easily with the user-friendly SKF thermal camera TKTI 21. With a thermal detector of 160 x 120 pixels and a visual camera, the TKTI 21 is suitable for many mechanical and electrical maintenance inspection applications. A wide temperature measurement range of -20 to +350 °C makes the device suitable for many proactive maintenance programmes. A visual and audible temperature limit alarm function alerts the user to abnormal conditions. The automatic hot and cold spot cursors quickly pinpoint the extremes. It has up to five movable temperature cursors/areas with individual emissivity settings for analysing complex scenes. Temperature difference of two cursors can be displayed on screen, enabling quick and easy temperature comparisons. Built-in emissivity tables allow easy emissivity value setting. The eleven selectable colour pallets are for ease of use. Fully radiometric thermal and visual images are stored on the micro SD card provided.